The salary comparison website surveyed more than 10,000 tech employees to see how median salaries break down across gender and age — although it doesn’t take into account things like location, department, or experience levels. Comparably’s data showed that the gender pay gap — where women are paid less than their male peers — is largest between workers ages 18-25, the age when most people start entering the work force. The average female tech worker only makes $66,000 while the male makes an average of $85,000, a 29% difference between median salaries. Comparably’s CEO Jason Nazar could only speculate, but thought the difference in pay at that age could be attributed to women re-entering the workforce after raising children, attributing to the lower initial salaries. 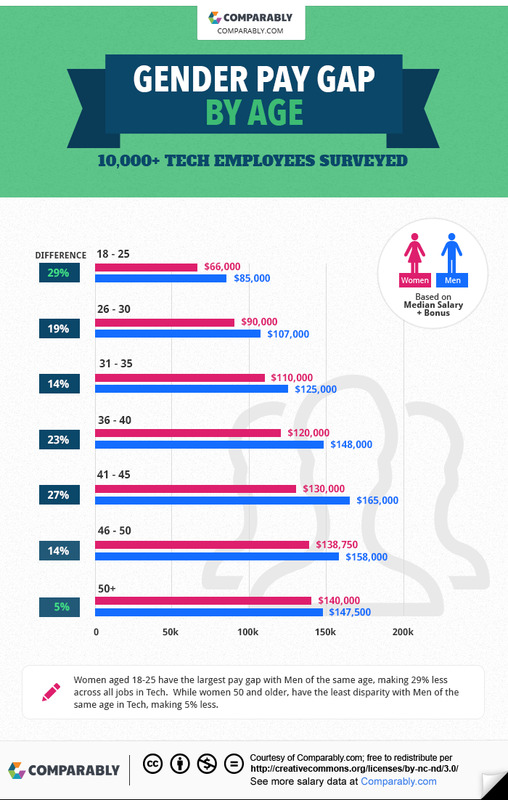 By the time they are in their 50s, the pay gap between men and women in tech shrinks back down to 5%.